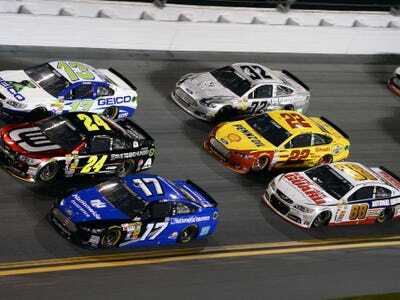 Mike DiNovo/USA TODAY SportsOne of the most beautiful sights in sports is NASCAR under the lights. I am NASCAR’s worst nightmare. Well, not me specifically, but sports fans like me. I love sports. I watch a LOT of sports. I don’t watch a lot of NASCAR. More importantly, I want to watch more NASCAR but I don’t. This is not born out of a lack of understanding of the sport, something that may affect other sports fans. I know who the best drivers are. I know how to spell Jimmie Johnson’s first name and that he needs one more championship to tie Dale Earnhardt and Richard Petty for the most all time (7). I know Dale Earnhardt Jr hates road course racing and that his dad had to nag him to wear his sponsor caps and hated being called “Dale Sr.” I know Brad Keselowski is a great driver but he is kind of annoying. OK, Keselowski it really annoying, unless you are a Keselowski fan, in which case he is awesome. I even have a favourite driver, having recently traded in Clint Bowyer (I loved his old no. 07 black Jack Daniels car) for Kyle Larson (my kids love Target, and I love his story and his no-steering wheel doughnuts). And yet, I still don’t watch a lot of NASCAR races and based on the television ratings, I am not alone. Of the 30 races so far this season, 24 had a lower TV rating this year compared to the 2013 season. There are three big issues for fans like me. 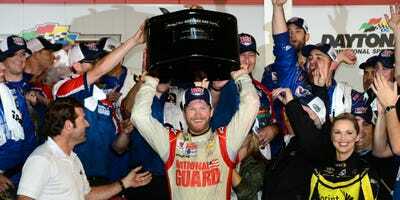 Christopher Gregory/Getty ImagesNot many casual sports fans are going to give up football for NASCAR. Early in the NASCAR season I tend to watch more races. It’s not necessarily must-watch TV. But if I am home, I will often have the race on even if I am doing something else. I will even watch a lot of Nationwide Series events, NASCAR’s “minor league circuit,” typically held the day before and will include a lot of the top drivers. But when the fall rolls around, there are just too many football games on. Games start at noon and go past midnight, often with several important games on at the same time. Even for somebody like me, with several monitors and TVs available, there just isn’t much room for NASCAR and if I turn it on, it usually won’t happen until the very end. First of all, I love NASCAR’s new championship format. In short, after the first 26 races, the top 16 drivers (with an emphasis on wins) become eligible for the championship chase in the final ten races. Four of the drivers are eliminated after the first three “Chase” races, and four more after the next three, and so on until there are only four drivers left to battle for the Sprint Cup in the final race of the season. The problem is the standings are still based on a point system that requires an advanced degree in mathematics to understand. 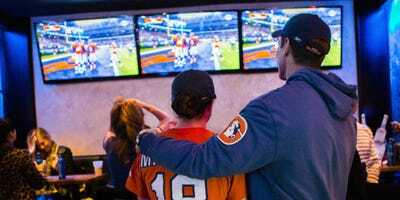 OK, it’s not that complicated, but it is still not nearly as simple as knowing when a football team scores a touchdown they get six points and when they win the game they get one point in the win column. Winning a race in NASCAR is worth 47 or 48 points depending on whether or not the driver led the most laps. Finishing second might be worth only 42 points or it could be worth as much as 44 points depending on how many laps they lead. And that’s the simple part. A casual fan isn’t going to know how many points a driver finishing tenth will get without a cheat-sheet or whether those points are good in a system with thousands of points on the line. Either eliminate points all together for drivers that don’t finish near the top, or have a separate set of “championship points” given just to drivers who finish in the top-5 or top-10 of a race and use those points to determine the championship. 3. Championship contenders are not necessarily going head-to-head for the Cup. Winning a NASCAR race requires one driver to beat 42 other drivers to the finish line, so in some sense it is nice that this is also how the final races are run even if only a small group of the drivers are actually battling for the Cup. But at the same time, it would be awesome if the top drivers could go head-to-head for the cup in a true playoff format with just minimal influence from non-playoff cars. 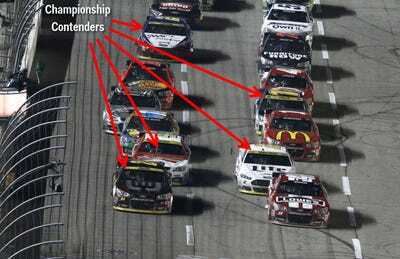 Instead, we see situations like the final laps in Texas this past weekend (see above) where just five of the top 13 drivers were championship contenders and three other contenders were nowhere to be seen. One way around this would be two checkered flags for each race, the normal checkered flag signaling the end of the main race and a second “championship” checkered flag for just the drivers still in contention for the Sprint Cup. Under this format, after the main race is over. Let all the cars go to the pits and take a 10-15 minute break. Then bring just the championship contenders back on to the track, start them in the order they finished the main race, and have them race another 15-30 laps depending on the size of the track. How great would it be to see the top drivers going head-to-head on the track without having to worry about lapped cars or wrecks caused by non-championship drivers. That would annoy the NASCAR purists. But that is something I would watch.